A stage actor (Klaus Maria Brandauer) in pre-WWII Germany colludes with the Nazis in order to continue working. Hungarian director Istvan Szabo helmed this fascinating update on the Faustian legend of “selling one’s soul to the devil”. Based on an early-20th-century novel by Klaus Mann, it remains one of the most compelling cinematic portraits of life in pre-WWII Nazi Europe — thanks in large part to a powerhouse performance by Klaus Maria Brandauer. Brandauer embodies ambitious actor Hendrik Hoefgen with true passion and energy, brilliantly showing the complexity of a man who is both sympathetic (we relate to his impulses) and pathetic (his choices are ethically dubious). 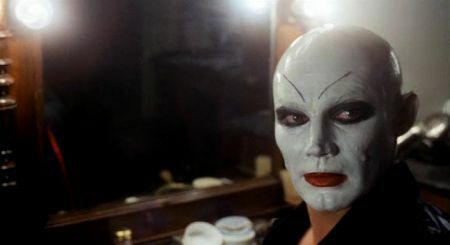 The film’s narrative moves quickly, in what was called by the New York Times (see review link below) “a daringly compressed style” — perhaps the inevitable result of translating from novel to screen; but this ultimately serves the larger purpose of showing us Hoefgen’s transformation over the years from idealistic socialist to compromised theatrical superstar. By the final powerful scene of this movie, we are no longer sure what to think or feel about our enigmatic protagonist — yet we understand that we could be there ourselves, but for the grace of God. Yes. Brandauer’s performance makes this must-see viewing. 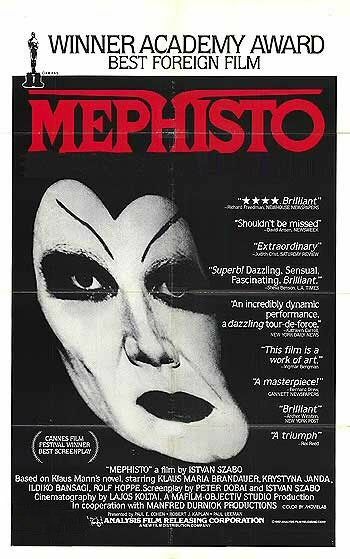 The lead in ‘Mephisto’ reminds me of him – which keeps me from seeing the character as complex. Brandauer plays a self-serving weakling (note how he practices developing a firm handshake after being told the one he has is limp). Though his performance dominates, the film’s somewhat unresolved end shows that his status as a Nazi pawn merely stunts him, keeping him in something of a delusional state. If you knew him in real life, most likely he’d ultimately be insufferable. The most memorable sequences are the short ones peppered throughout which say much about Hoefgen’s character.